Greater TORONTO – especially suburbia – is awash in traffic. Something has to change. The Toronto Region Board of Trade has launched a new advertising campaign to boost public support for funding a massive regional transportation plan. The region is losing about $6 billion annually in lost productivity due to traffic congestion. 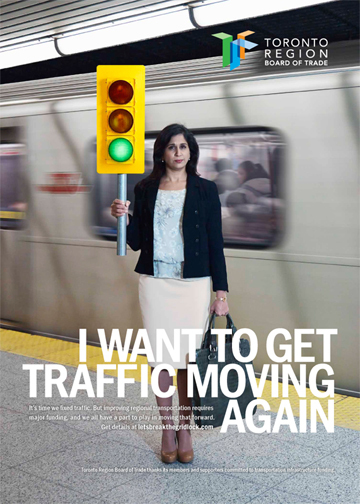 This entry was posted in Transport and tagged Green Light advertising campaign, Metrolinx, The Big Move, Toronto Region Board of Trade. Bookmark the permalink.